Planning permission was granted in April and now specialist contractors have started work on site to prepare it for construction to start. Great Barr-based The Coleman Group has been appointed to carry out the work which includes demolition and remediation. The new design for the School by Associated Architects aims to keep as much heritage as possible and add stunning new buildings which reflect the site’s historic industrial surroundings. Designers have worked closely with conservation specialists, planners and Historic England. The 7,900 square metre build will use a mix of pre-cast white concrete, bronze metal cladding and glazing. Inside the building there will be specialist teaching and social learning spaces, design studios, specialist labs, multi-disciplinary workshops, lecture theatre, café, offices, meeting rooms, ICT rooms and a top floor super studio with double height ceilings. 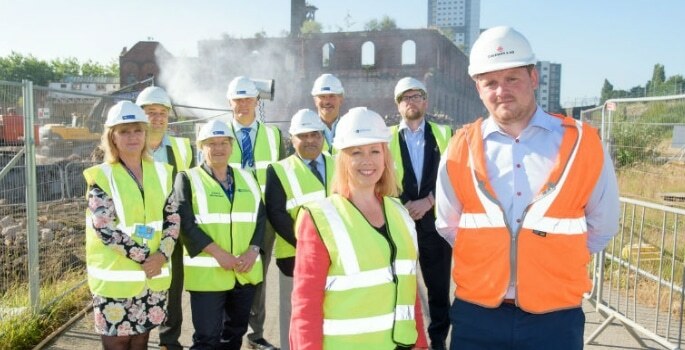 Deputy Vice-Chancellor Jackie Dunne, who is the University’s project lead for Springfield, said: “It is great to be on site and seeing the project moving forward. With the preparatory works under way we can start looking towards the main build getting under way in the autumn. “Once complete it will be a fantastic addition to the city. Springfield is a key strategic project for the University and we are committed to realising the vision of the site and the part this will play in regenerating Wolverhampton. The 12 acre Springfield Campus will be a centre of excellence for the built environment, construction and high value manufacturing to be delivered by the University and its partners. The tender has also gone out to market for a construction partner to act as the main build contractor for the site and it is hoped work will start in the early autumn.